China’s shift to green energy has made a huge contribution to reducing the country’s dependence on imported fossil fuels, write researchers John A. Mathews and Xin Huang. But for China’s renewables revolution, the world would have faced potentially catastrophic geopolitical tensions over oil and gas. Courtesy John Mathews’ Global Green Shift blog. Commentators in the U.S. are finally beginning to take notice of the strategic considerations behind China’s continuing shift to green energy, which we have been documenting for years. China, today by far the world’s largest player in solar and wind, has always regarded the development of renewables from multiple perspectives, as a way to reduce pollution and emissions, but even more importantly, to reduce reliance on fossil fuels. China has made a deliberate choice to manufacture all the devices needed for its renewable energy generation. In this race, it has left the U.S. far behind. Data has now been released from China’s National Energy Administration (NEA) that enable the changes recorded in the year 2017 to be integrated into previous analyses. 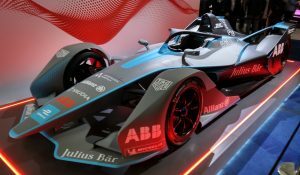 The headline result is that China’s radical steps in decarbonizing its electric power system, linked to the decommissioning of much of its carbon-intensive heavy industry and promotion of an electric vehicle industry, continue at a frantic pace. China maintains its role as driver of the global green shift. In this article we present detailed data on China’s green shift in electric power, taking the story up to the year 2017 and updating previous work. 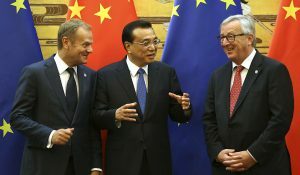 We offer new analyses that take the story up to targets for 2020, by which time China is likely to have achieved clean energy targets (utilizing water, wind and sun) with capacity of more than 800 GW – meaning that China would be the world’s dominant clean energy power with more than 1 trillion watts (1 terawatt TW) capacity of clean power by the early 2020s. But at the same time, China maintains a continuing dependence on coal for electric power, although with declining dependence. The Chinese government seems to be maintaining a cap on coal utilization for electric power generation of 1,100 GW (1.1 TW). 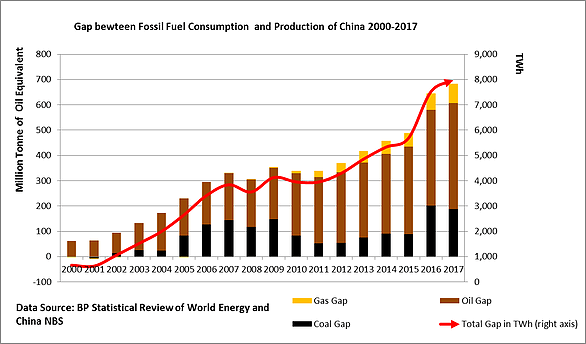 In this article we also analyze China’s continuing dependence on fossil fuels, examining the behaviour of the ‘gap’ between rising consumption and production – for coal, oil and gas. We demonstrate that the ‘gap’ between consumption and production of fossil fuels is growing (as China’s economy continues to expand), thereby diminishing China’s energy security. To what extent then has China’s green shift in electric power generation moderated this rising gap between fossil fuel consumption and production? To answer this question we introduce new calculations that aggregate the fossil fuel import dependence in three ways – in terms of oil-equivalent (favoured by the BP Statistical Review), in terms of coal-equivalent (favoured by the China National Bureau of Statistics (NBS)); and in terms of power generation equivalent (in TWh) – favoured by us. We demonstrate that the ‘gap’ in 2017 has grown to 125% of China’s electric power generation – where the gap has reached 8000 TWh compared with 2017 electric power generation of 6400 TWh. China’s green shift in power generation also reached 1600 TWh in 2017 – meaning that this green shift moderated the growing fossil fuel gap by 20%, down from a putative 9600 TWh to 8000 TWh. Had China been dependent on fossil fuel imports to a putative level of 9600 TWh, this would have condemned the country to extreme dependence on geopolitical hotspots for its fuel imports. But in 2017 China remains a black economy, with severe dependence on coal-fired power. China’s coal consumption in 2017 appears to have risen slightly – according to still-provisional data. While coal-fired power stations continue to be closed, those remaining appear to have burnt more coal in 2017 than in 2016, making China still the world’s largest coal-burning country. The slight increase in 2017 is nevertheless still well below China’s peak coal consumption and production reached in 2013; it does not reverse the downward trend in China’s coal dependence. 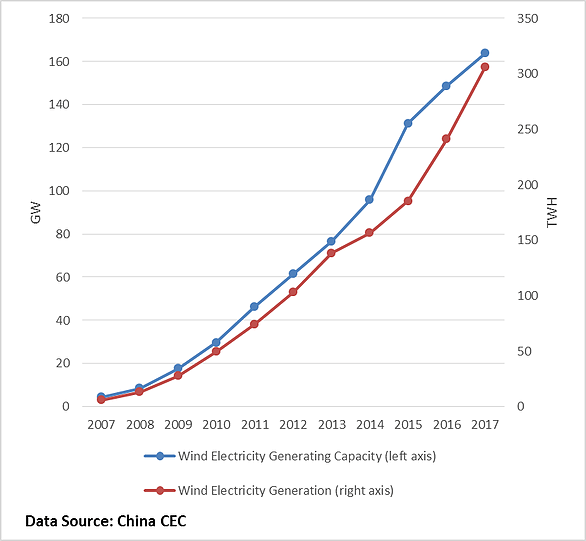 China’s energy story can be told through two principal charts, one showing annual electricity generated from various sources up to and including 2017, and a second chart showing China’s domestic capacity additions and the rising proportion attributable to water, wind and sun – again including data for the year 2017. Fig. 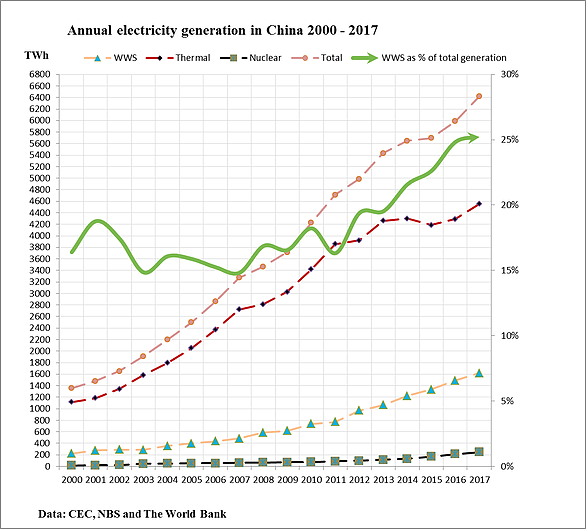 1 reveals that total power generation in China has risen from around 1400 TWh in the late 1990s to 6400 TWh (or billion kWh) in 2017 – by far the largest of any country in the world. This is the energy system that powers China’s vast manufacturing system. There is a clear inflection point at the year 2001, when China joined the WTO and declared itself “open for business”. The annual rate of growth of China’s overall electric power system over the period 2001 to 2017 is 20.9% — an astonishing rate of expansion for a system as large as that which supplies China’s power. 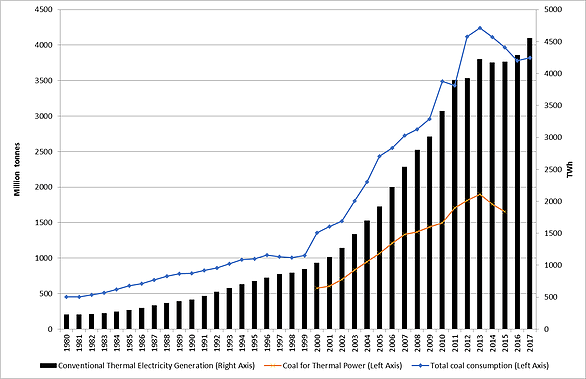 The red stippled line shows electricity sourced from coal and other fossil fuels, which up until around 2010/2011 rose as fast as the system overall, and since then has been increasing more slowly, and reaching 4600 TWh by 2017. Meanwhile, renewable sources (from water, wind and sun) have been increasing exponentially, to reach 1600 TWh by 2017, growing from 2001 to 2017 at an average rate of 30.2% per annum. So the green shift in power generation exceeds the growth in the power system overall, over the past decade – a highly significant result. 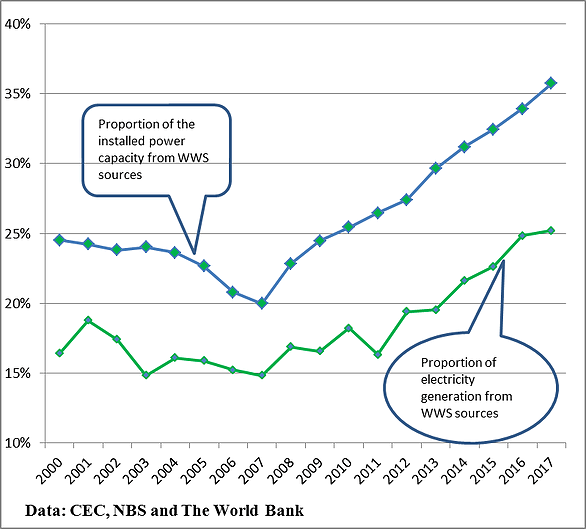 The bold green line shows that WWS sources accounted for 25% of power generated by 2017 – up from 15% in 2007, or a 10% increase in the proportion of green electricity generated in just the past decade. No other country comes even close to this pace of green change. When we turn to capacity additions made in 2017, the picture is even more striking. Fig. 2 shows that the proportion of electric generating capacity sourced from water, wind and sun exceeded 35% by 2017 – up from 20% in 2006 when China’s green shift started in earnest. This is a 15% shift towards green power capacity in just over the past decade – an even more striking rate of change of the green shift. If carried through at the same pace over the next decade, China’s power capacity would be more green than black within the next decade – by 2028. This is why China’s leadership can confidently make assertions that the country’s carbon emissions will peak before 2030.
comparison with the situation in Germany is instructive – as shown in Fig. 3. Here we see the country’s dependence on coal-fired power reduce, and dependence on nuclear drastically reduce, while reliance on renewables steadily grows. Germany’s two major parties – currently seeking to renew their coalition agreement – are committed to phasing out dependence on coal altogether. 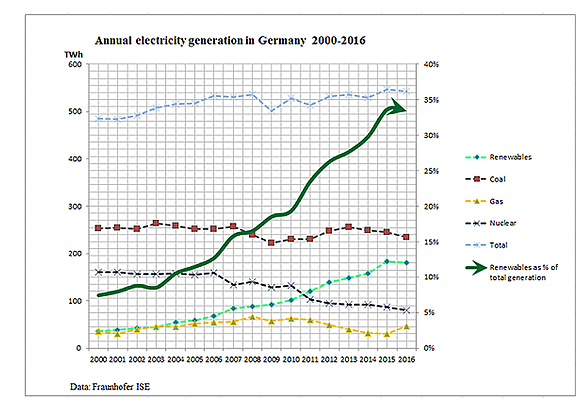 Germany’s total power generation reached 520 TWh in 2016 (around one twelfth of China’s) while under the influence of German federal government policy (Energiewende, or “Energy transformation”) the proportion attributable to WWS sources reached 35%. China however is still a largely black energy power, with dependence on coal for power generation marginally increasing in 2017 over the level in 2016 – after successive falls each year since both coal consumption and production peaked in 2013. We discuss these trends in detail below. Detailed data for China’s energy revolution, couched in terms of (1) capacity additions; (2) electricity generated; and (3) investment in new capacity, are shown in Table 1. By 2017 China’s electric power capacity reached 1,777 GW, or 1.8 TW – by far the largest of any country in the world (compared with around 1 TW for the US). Capacity from renewable sources (water, wind and sun – WWS) reached 635.1 GW – making China the world superpower in green energy. Capacity added in 2017 reached 131.2 GW, with 52.1 GW coming from thermal sources (coal, gas) and 77.0 GW from WWS sources. So new capacity from thermal sources accounted for just 40% of new capacity, while WWS sources accounted for 59% of new capacity. This is powerful evidence for the greening of China’s power system. But it is still a black system. By 2017 the system had thermal capacity of 1,106 GW compared with 635 GW for WWS sources; this means in terms of the total system that 35% capacity is reached by WWS sources. In terms of annual growth, thermal sources increased in 2017 only by 5% compared with 14% for WWS sources. Thus the green growth exceeds black growth. As for nuclear, just 2.2 GW new capacity was added in 2017, accounting for just 2% of new capacity added. What is striking is that solar capacity additions in 2017 exceeded those from thermal sources – with 52.9 GW being added from solar, compared with 52.1 GW from thermal sources. That’s a new solar power station at 1 GW being added each week, as well as a new coal-burning power plant being added each week. These trends are captured in Fig. 4. Table 1 (2) confirms that China’s electric power generation totalled 6,418 TWh in 2017, up 7.1% from the level in 2016. 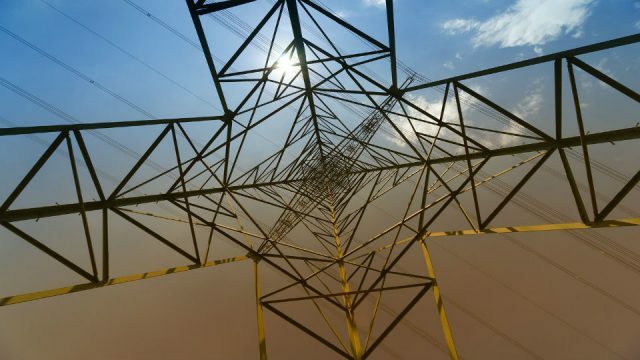 Power generated from WWS sources increased to 1,618 TWh, an increase of 9% on the level in 2016, and accounting for 25% of the total power generated. 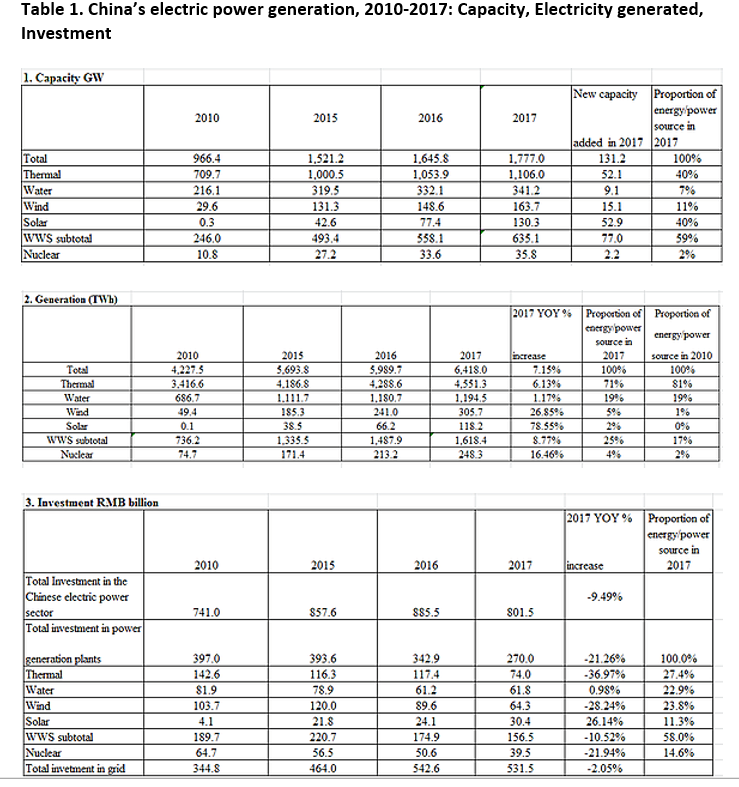 When we look at investment (Table 1 (3)) we see that investment in the power system totalled RMB 801 billion in 2017 – marginally down on the level reached in 2016. The level of investment in WWS sources was down 10% on 2016 levels, which is concerning – but the level of investment in thermal sources declined even more, being down 37% on 2016 levels. Trends over the past three years, spanning 2015 to 2017, offer striking confirmation of these greening trends in capacity, power generation and investment, as shown in Table 2. The data in Table 2 reveal that in terms of capacity added, WWS sources outranked thermal sources by 34%; power generated over the three years saw WWS accounting for 34% of the total; and investment in WWS power sources outranked investment in thermal sources by more than threefold. Investment in WWS sources in 2017 totalled RMB 156.5 billion (or US$ 24.8 billion at an exchange rate of 6.3). Note that these estimates are markedly different from those provided by Bloomberg New Energy Finance (BNEF) in London. BNEF have issued their estimates for 2017, where they state: “Overall, Chinese investment in all the clean energy technologies was $132.6 billion, up 24% setting a new record. The next biggest investing country was the U.S., at $56.9 billion, up 1% on 2016 despite the less friendly tone towards renewables adopted by the Trump administration.”Clearly China’s NEA is using very different definitions of clean energy investment from those utilized by BNEF. 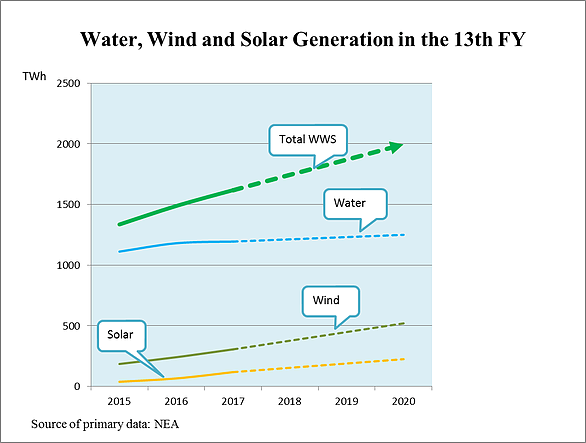 Let us now look at the three WWS sources – solar, wind and hydro – and the targets for 2020. Solar PV emerged as a major player in 2017, with 53 GW new solar PV capacity added (at more than 1 GW per week) exceeding new capacity from thermal sources (52 GW). This is the first time that China has added more solar PV capacity than coal or gas capacity in a single year – providing yet another indicator of the pace of the green shift. The solar PV capacity added in China in 2017 represented a 68% jump on the level recorded in 2016, and accounted for around half of global solar PV capacity additions. The Bloomberg New Energy Finance (BNEF) team in London describe this as China’s 53 GW solar boom. China’s cumulative solar PV capacity has now reached around 130 GW, with an official target set for 2020 at 165 GW – a target very likely to be exceeded. Some observers are predicting that China will reach a solar PV capacity of 250 GW by 2020. China’s record rate of solar PV capacity additions is clearly driving the accelerated rate of installation globally. In 2017 China added no less than 15.1 GW of new wind capacity, bringing the cumulative total of wind capacity to 163 GW. 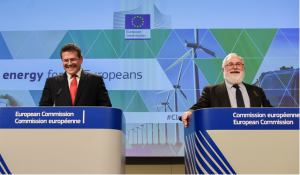 The target is to reach 260 GW installed wind capacity by 2020 – a target that appears to be eminently achievable. In terms of hydropower, China added just 9.1 GW capacity in 2017 (upgrading existing dams) bringing the cumulative capacity to 341.2 GW – making China again the largest deployer of hydropower in the world. Hydropower has reached close to its maximum practicable capacity in China, and the target for 2020 is set at just 380 GW – which on present trends does not look as though it will be exceeded. The combined WWS target for 2020 is thus 805 GW. Indeed if the 2020 target for solar PV is raised in line with observer expectations, to 250 GW, than China’s green power capacity would be expected to reach 890 GW by 2020. This would mean that China would be expected to pass the 1000 GW (1 TW) milestone for green WWS power by 2021 or 2022 at the latest – the first country to do so. 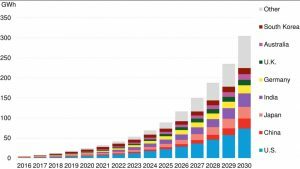 These targets, and cumulative capacities reached for hydro, wind and solar PV by 2017, with targets for 2020, are displayed in Fig 4A. If indeed thermal power capacity is to be ‘capped’ at 1,100 GW, then we can see that the WWS/thermal capacity would rise to 73.2% by 2020, up from 57.4% in 2017. 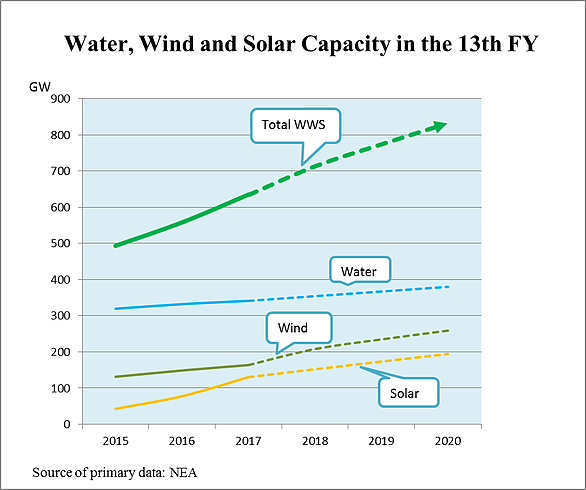 This jump of 15.8% in the WWS/thermal capacity ratio in just three years provides another indication of the rapid pace of the green power shift in China. A striking feature of the 2017 results is that the levels of curtailment have markedly declined. It has been a source of great concern in China (and a source of foreign criticism) that much of the power generated by renewable systems (mainly wind and solar PV) is not actually supplied to the grid, because of grid integration issues. The news conference of National Energy Administration (NEA) (http://www.nea.gov.cn/2018-01/24/c_136921015.htm) of Jan. 24, 2018 confirmed that in 2017, 12% of wind power production was curtailed versus 17.2 % in 2016. 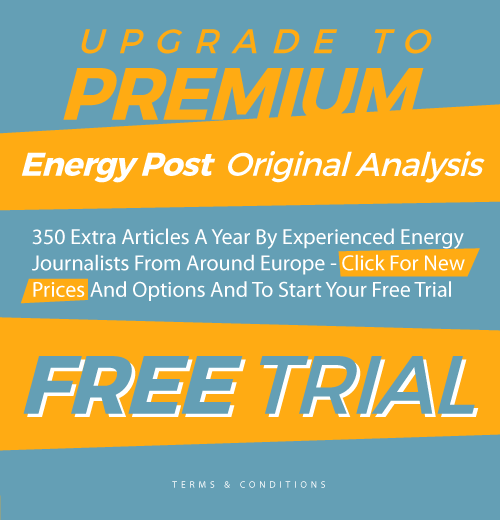 Thus curtailment of wind energy production dropped 5.2 percentage points compared to 2016 – the system absorbed much more of the wind power generated. For the case of solar PV, 6% of wind power production was curtailed in 2017 versus 10.3% in 2016; thus curtailment dropped 4.3 percentage points compared to 2016.These are becoming close to “normal” levels of curtailment. 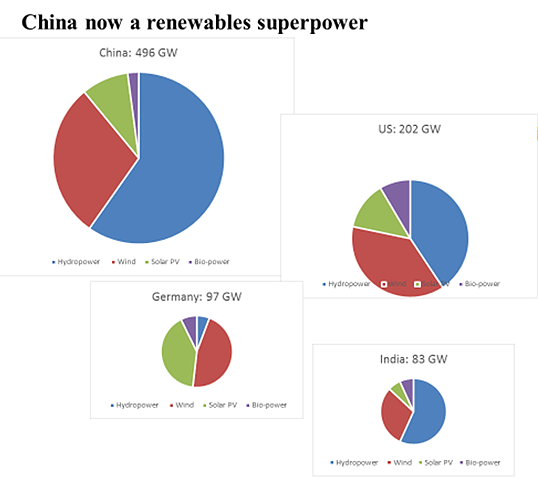 When the build-up in renewables capacity in China is compared with that found in other countries, China emerges as a superstar. The chart below (Fig.5) shows the situation utilizing data up to 2015; no doubt as data for other countries is made available for 2016 and 2017 the trends will only be strengthened. Note that China’s WWS capacity has increased from 493 GW in 2015 to 558 GW in 2016 and has now reached 635 GW in 2017. At this rate, China will be a ‘terawatt renewables power’ by the early 2020s. 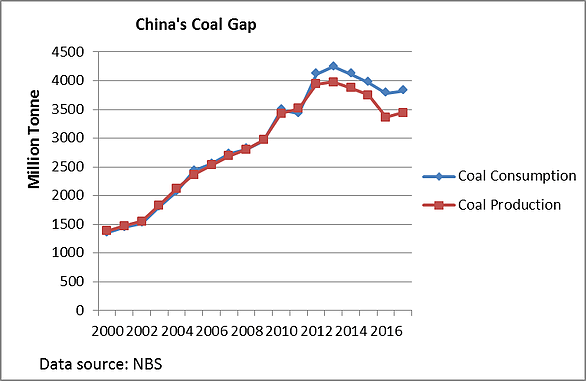 Alongside China’s rapid greening of its power system, there is the continuing issue of its black, coal-fired system, which also continues to expand (after a couple of years of contraction). China’s continuing reliance on coal for its electric power system is vividly captured in Fig.6. This chart reveals the continuing reliance of China’s electric power system on coal; while contracting in the years 2015-2016 it is expanding again in the year 2017. That is clearly a trend that is of great concern in China. Statistics for total Chinese coal consumption in 2017 are not yet available. However, we can gain a feel for the likely level of consumption by examining the amount of total coal production in 2017 (3.45 billion tonnes) and total coal imports (0.27 billion tonnes). By adding these two totals, we see that the (apparent) total domestic consumption should exceed 3.72 billion tonnes, which matches Brookings’ forecast of 3.82 billion tonnes. We use this figure of 3.82 billion tonnes in our charts below. Firstly we indicate the extent to which China remains a ‘black’ economy, in Fig.6, which indicates rising levels of coal-fired power generation and corresponding rising levels of coal consumption (largely in power generation), which peaked in the year 2013. The slight (apparent) rise in 2017 does not reverse the overall downward trend in coal dependence. The data from which Fig. 6 is drawn are displayed below in Table 3. 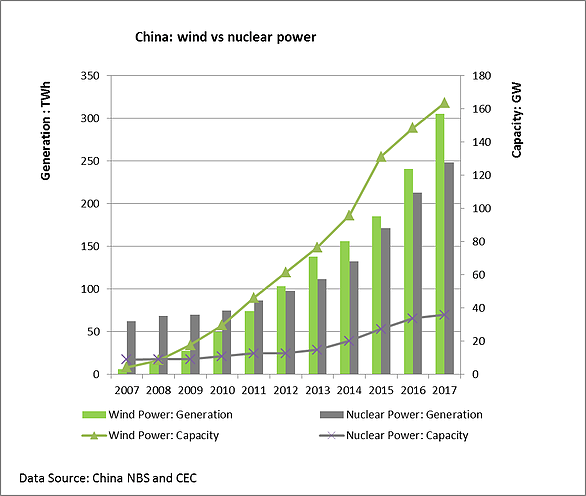 This black face of China may be compared with the green face, captured by the increases in wind power in China, shown in Fig.7. Since so many prominent scientists continue to promote nuclear as a “clean” energy source for China, it is important to monitor the choices that China is making in its domestic energy investments. The chart (Fig.8) reveals that in terms of capacity additions, wind power outranked nuclear as early as 2008, while in terms of electricity generated, wind outranked nuclear by the year 2011. The gap between wind power and nuclear has only widened since then, as revealed clearly by Fig.8. What is driving China’s green shift? There is a dominating factor driving China’s energy choices – growing dependence on fossil fuel imports, particularly oil imports for transport and coal imports for power generation. The growing gap between domestic production and consumption is shown in Fig.9. 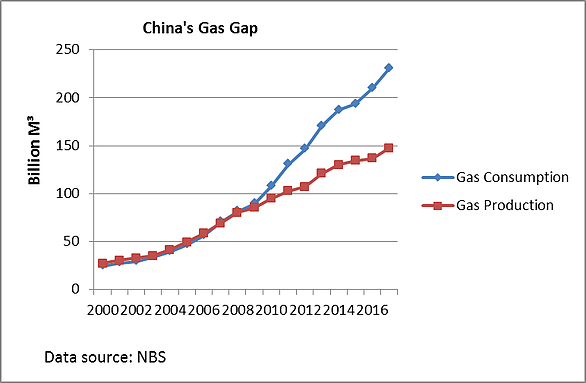 As the gap between production and consumption expands, and so dependence on imports grows, so the geopolitical limits to China’s energy expansion become more pressing. Without China’s shift to renewables, all of which are products of manufacturing, China would be facing a catastrophe. Data for 2017 now reveal how dramatic has been the impact of China’s green energy shift in reducing its dependence on fossil fuel imports – and hence in improving the country’s energy security. 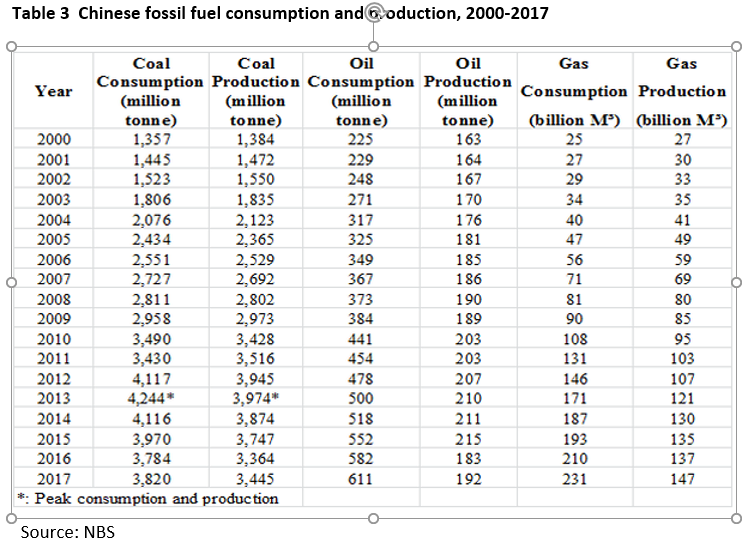 In Table 3 we reveal the growing gap between production and consumption of the three major fossil fuels in China – with imports having to cover the gap. This increases China’s dependence on fossil fuel imports – which in turn reduces its energy security. The shift towards green electric power is what holds this growing dependence on fossil fuel imports in check. 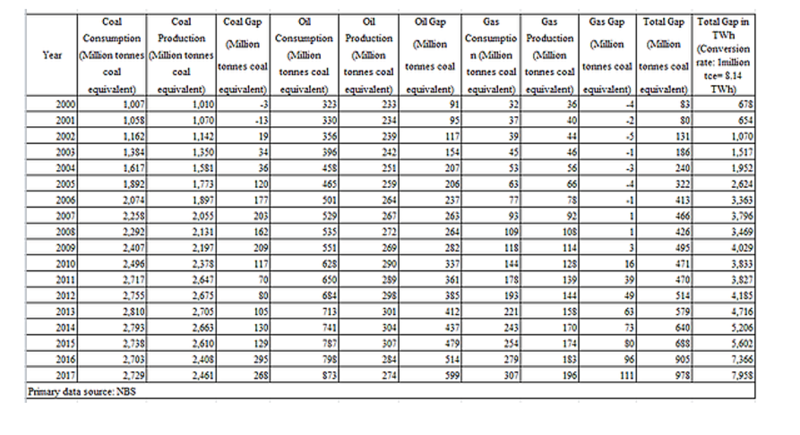 Table 3 reveals this growing dependence on fossil fuels imports in China. The oil gap has expanded from 62 million tonnes in the year 2000 to 420 million tonnes in 2017. The coal gap has expanded from -27 million tonnes in 2000 to 374 million tonnes in 2017; while the gas gap jumped from -3 billion M³ in 2000 to 83 billion M³ in the year 2017. These trends are shown in Fig. 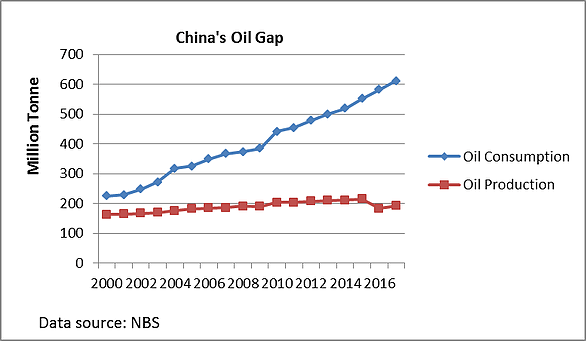 9A, B and C.
Oil has accounted for no less than 60% of the total gap, reflecting the fact that China is a country well endowed with coal but not with oil or gas. The respective gaps between fossil fuel consumption and production continue to rise. Increases in the ‘gap’ for gas are particularly noteworthy, given that it is seen as a cleaner fossil fuel than either coal or oil. It is worth pointing out that China ‘peaked’ in terms of coal consumption and production in 2013, and its dependence on coal power is now declining. Oil has not yet peaked in terms of consumption while production appears to have peaked in 2015; thus China is increasingly dependent on oil imports. Gas is increasing rapidly in terms of consumption and production – but in terms of total impact (measured in TWh), it is still far below the other fossil fuels. We shall now put these data on fossil fuel dependence into common units, utilizing standard translations into ‘coal equivalent’ and into ‘oil equivalent’. We may translate this rising gap in a common fossil fuel equivalent into its equivalent in terms of electric power generation, which will enable us to gain a feel for how the green shift in power generation has been moderating China’s growing dependence on fossil fuel imports. 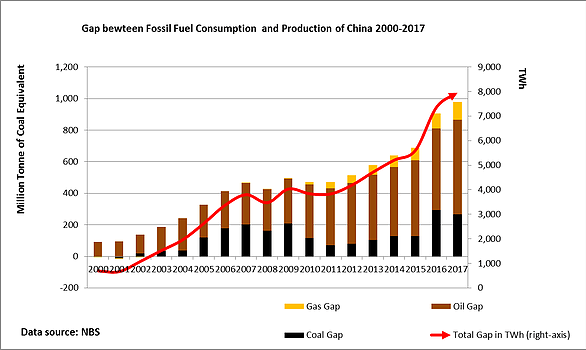 Using data from NBS for the years 2000 to 2017, and for 2000 to 2016 from BP Statistical Review, we show China’s fossil fuel gap over the years 2000 to 2017 in Table 4A in terms of coal equivalent, and in Table 4B in terms of oil equivalent. In the final column of each Table, we show the equivalent gap in terms of electric power generation, in TWh, which provides a ‘neutral’ measure of fossil fuel dependence. The data reveal that the fossil fuel ‘gap’ between consumption and production has grown to 684 million tonnes oil equivalent, or (from Table 4B), 978 million tonnes coal equivalent. In terms of electric power generation, this means that the gap has grown to very nearly 8000 TWh by 2017 – as shown in Tables 4A and 4B (and illustrated in Figs. 10A and B). This gap reached around 8000 TWh in the 16 years after 2001 – or a measure of energy insecurity accelerating at around 500 TWh each year – with a marked acceleration in the last two years. Our final point is to assess this accelerating degree of fossil fuel dependence against green power production, as a measure of the growing impact of China’s green power shift. The total fossil fuel gap (indicating degree of import dependence – hence, a measure of energy insecurity) of 8000 TWh may be contrasted, firstly, with total power generation of 6400 TWh (meaning that the fossil fuel imports gap has now reached 125% of the total power generation; and secondly, with WWS power generation of 1600 TWh – so that green power production by 2017 was equivalent to one fifth, or 20%, of the total fossil fuel gap. This means that green power production moderated or offset the otherwise extreme fossil fuel import dependence; without the green power generation (as a counter-factual) China’s fossil fuel dependence would have been 1600 TWh ‘worse’ – to reach a putative level of 9600 TWh. Another way of putting this is to state that green power generation by 2017 was reducing the fossil fuel imports gap by 20% (making it 80% of what it would have been otherwise). This green shift in China thus reduces the worst of the country’s environmental problems as well as reducing its dependence on imports from geopolitical hotspots. It is this effect of China’s green shift in reducing geopolitical tension that may be viewed as constituting its major impact. If left unchecked by the green shift, the accelerating fossil fuel import dependence would spell catastrophe for China, and trigger oil, coal and gas wars around the world. John Mathews is professor of strategic management at MGSM, Macquarie University. Xin Huang is a Research Assistant at MGSM; she has worked in the Australian and Chinese financial sectors. 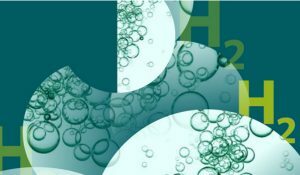 This article was first published on Mathews’ Global Green Shift blog and is republished here with permission. We show the complete equivalence for each year in order to eliminate any ambiguity, with BP Statistical Review continuing to use statistics in oil-equivalent and China’s NBS utilizing statistics in terms of coal-equivalent. That’s hyperbole and mere speculation. Most unlikely that there would have been a catastrophe or wars. All we would see now is higher carbon emissions from China, and world fossil fuel prices higher due to greater demand from China. The concept of “State Entrepreneurship” (fostering socially-desirable technological innovations with economic purposes that go far beyond the scope of economics itself through the smart usage of modern monetary theory by trail-blazing, state-guided institutions) should get more attention in the putative West. The Chinese do seem to have a flair to spot opportunities where most others can only see crisis. We westerners could learn how to do the same. USA with a population of 300 million uses 20 mmbbl/d oil. Any nation with reasonable strategic thinking can estimate its oil need (to match USA prosperity levels) based on scaling. There just isn’t enough oil to supply Chinise population of 1300 million. One has to shape own destiny which China is doing and leading the world. Can’t say same about some other countries. Since China is leading with EV growth, including buses, I wonder whether one can predict from the current adoption trajectory when this will show up as a noticeable effect for the oil consumption. The rate of rise shown in fig. 9 looks pretty solid.